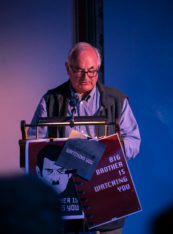 Our Orwell Live projects began in 2017, as we celebrated our partnership with UCL by staging the UK’s first live reading of the entire of George Orwell’s Nineteen Eighty-Four. 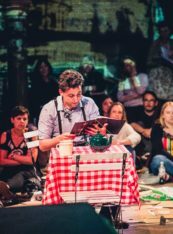 In 2018 we ran two live, dramatised readings of Orwell’s Down and Out in Paris and London – one in each capital city. 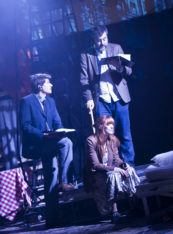 Both productions were directed by Hannah Price and produced by Libby Brodie Productions and were live streamed to an audience across the UK and the world. You can watch them all here. 1984 Live was a landmark event which saw over 50 leading cultural figures read the whole of Orwell’s Nineteen Eighty-Four alongside members of the public to create the UK’s first ever live reading, on the site of the inspiration for the Ministry of Truth – Senate House. 1984 Live was part of the UCL Festival of Culture 2017 and libraries and theatres across the country screened the reading and organised satellite events and activities. Find the cast and full list of readers here. The reading begins at 11.18mins and lasts for around 11 hours. Drawing on the iconic works of Orwell and combining these with real-life, modern-day testimonies, Orwell’s Down and Out Live is an immersive production which focuses on the phenomenon of homelessness both in the past and present day. Read live by politicians, artists, celebrities, activists and members of the homeless community and using a combination of music, story-telling, film and performance this live theatrical event, directed by Hannah Price, ran in London for one day and was accompanied by new poetic responses in English and French. The event was the result of a collaboration between The Orwell Foundation, The Joseph Rowntree Foundation, Libby Brodie Productions and UCL’s Festival of Culture. It was supported using public funding by Arts Council England. We are grateful to generous sponsorship from White Light, the Young Theatre and Stone Nest. Drawing on the iconic works of Orwell and combining these with real-life, modern-day testimonies, Orwell’s Down and Out Live is an immersive production which focuses on the phenomenon of homelessness both in the past and present day. Read live by politicians, artists, celebrities, activists and members of the homeless community and using a combination of music, story-telling, film and performance this live theatrical event, directed by Hannah Price, ran in Paris for one day and was accompanied by new poetic responses in English and French. The event was the result of a collaboration between The Orwell Foundation, The Joseph Rowntree Foundation, Libby Brodie Productions and UCL’s Festival of Culture. It was supported using public funding by Arts Council England.